G-Force GF-125 Racing Pants, Large, Black - 4127LRGBK G-Force Safety Eq. 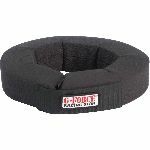 Vendor Name: G-Force Safety Eq. 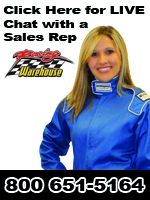 G-FORCE Racing Gear is proud to introduce a new addition to the driver suit line in the GF-125 2-piece uniform. 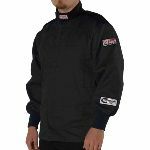 The GF-125 Single Layer, two piece suit is built as an addition to the G-FORCE Racing Gear suit line in order to offer another option to the single layer market. 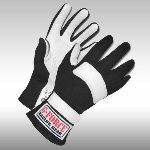 The award winning GTex construction that has been used in all G-FORCE Racing Gear suits has been utilized to manufacture the GF-125 at specs that exceed the SFI 3.2A/1 specifications. The SFI 3.2A/1 tag is included and has been moved to the left arm cuff so that tech inspectors can easily see the certification. 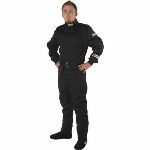 The single layer of this suit is made with Pyrovatex® fabric to achieve the TPP rating of near 10. As the pictures show, the GF-125 comes with an attractive semi-gloss finish. With the semi-gloss finish, as a driver the wearer can stand out and be noticed. The clean color styles of the GF-125 give a finished look to attract both fans and potential sponsors. The shoulders of the GF-125 come accented with straight, black epaulets that give the driver a crisp edge to the apex of the shoulder line so that you portray the consummate racer. The pants for this new suit come standard with an elastic waist band for a wide range of sizing. 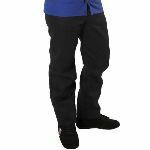 The legs of the GF-125 are finished with hidden cuffs under a wide, boot cuff pant leg. The boot cuff mirrors today’s trends and proves, just like your racing technology, your styles match the latest advancements. The Pants and Jackets are available in Black, Blue or Red. The pockets of the GF-125 are inset or sewn inside to hide seams and provide more usable space with a cleaner design. The GF-125 is perfect for those wishing to distance themselves from the pack without breaking the bank.